Hillary Clinton kept alive her campaign for the Democratic presidential nomination by winning Pennsylvania’s April 22 primary. National attention now turns to the Indiana and North Carolina primaries on May 6. Polls show Obama leading in North Carolina and a dead heat in Indiana. Obama carried Philadelphia by a huge 130,461 vote margin, spurred by a powerful grassroots get-out-the-vote drive and a rally of 39,000 people at Independence Mall April 18. Obama also carried Chester, Delaware, Dauphin, Lancaster and Centre counties. But it was not enough to offset Clinton’s majorities in every other county including Allegheny, which includes Pittsburgh. More than 2,300,000 voters cast ballots. 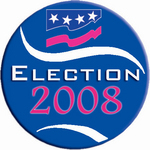 Election officials said it was twice the 26 percent turnout in 2004. Obama still leads the popular vote by half a million votes. He also continues to lead in elected delegates, although with the Pennsylania vote Clinton has somewhat narrowed the elected delegate gap. Superdelegates have increasingly gravitated toward Obama. Oddly, she did not mention Republican John McCain once in her speech. Instead, she echoed Obama’s celebrated speech on race delivered last month at Philadelphia’s Constitution Center. The founding fathers envisioned a “more perfect union,” she said, adding, “Neither Senator Obama nor I were included in that vision. This next generation will grow up believing an African American or a woman can be the president of the United States.” It touched off the strongest applause she received. Clinton’s change of tone may reflect the sharp criticism she has received for her negative campaign tactics, such as her slip of the tongue, “Osama, I mean, Obama,” and a last-minute TV ad that ominously flashed the image of Osama bin Laden on the screen. A New York Times editorial the day after the Pennsylvania primary was headlined “The Low Road to Victory.” The Times, which had endorsed Clinton before Super Tuesday, declared, “It is past time for Hillary Rodham Clinton to acknowledge that the negativity, for which she is mostly responsible, does nothing but harm her, her opponents, and the 2008 election.” Other observers point out that Clinton’s fear and smear strategy is a gift to McCain. Pressure is growing for Democrats to determine the nominee by the end of June, to give the forces arrayed against McCain and the Republican right time to regroup and unite for the general election in November. Nevertheless Clinton made clear in her victory speech that she intends to push ahead in the remaining primaries. Obama, speaking to a crowd in Evansville, Ind., on April 22, congratulated Clinton and also thanked the hundreds of thousands of Pennsylvanians “who stood with our campaign today, closed the gap in Pennsylvania.” He was referring to polls as recent as February showing Clinton with a commanding lead — up to 30 points — over Obama. His campaign registered tens of thousands of new voters and thousands more transferred from the Republican to the Democratic Party. “It is those voters who will lead us to victory in November,” he said.